This problem suggested by one of our friends in Wisconsin. 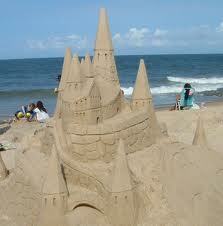 Roberto and his friends built a five story castle in the sand complete with moat. Each story of the castle was 10 inches high. They wanted to put a flag on the top of the castle. How high did they have to reach? Give your answer in feet and inches. This entry was posted in Uncategorized and tagged convert inches to feet, multiplication problem. Bookmark the permalink.